Click the flyer below to enlarge it. Andrea Lodato Dickel is a native of Evansville who is currently principal of St. Philip School. 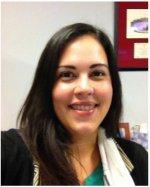 Prior to her 8 years there, she worked as a bilingual Spanish/English teacher in Madison, Wisconsin. She obtained her BA in Spanish from Indiana University in 2001, along with her BS in Elementary Education, after spending her junior year of college in Madrid, Spain. Over the years, she has spent much time living and working with the Hispanic community, especially in Madison. She also did a principal exchange program in 2012 where she spent two weeks experiencing schools in Mexico to learn more about the education system there and to keep up on her language skills. She is very excited to be teaching Spanish again and supporting the Latino community in southern Indiana by giving more people the tools to communicate with and support them. 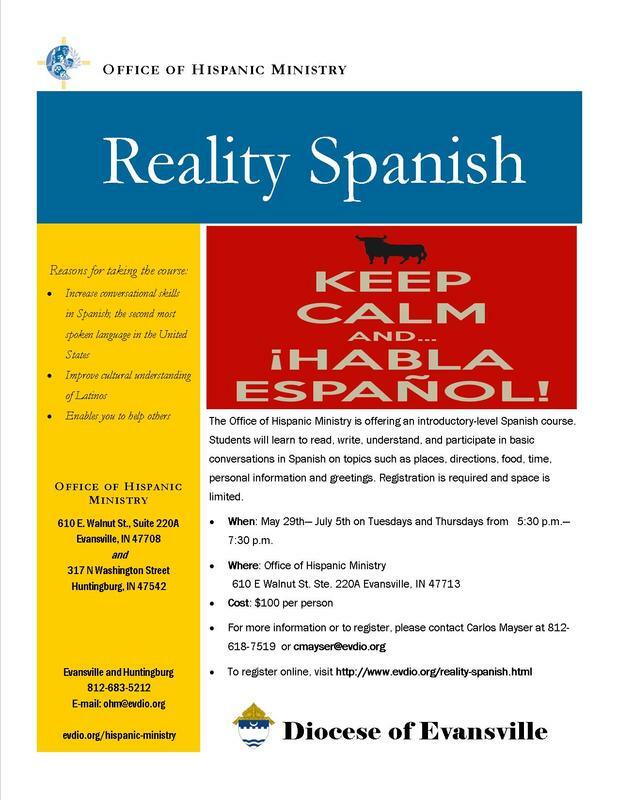 This will be her fourth time to teach Reality Spanish. Alma Dabrowski is a native of El Paso, Texas and has lived here in Evansville for the last 8 years. She currently works for the EVSC as the Social Worker for Special Populations and as the Homeless Liaison for the corporation. She obtained her BSW from the University of Texas-El Paso and her Masters degree in Social Work from the University of Wisconsin-Madison. Alma is native Spanish speaker and has worked with the Latino community here and in Madison. She is excited to be co-teaching Reality Spanish again and is looking forward to helping people in the community expand their communication skills and support our growing Latino community. To register and pay, please fill out the registration form below and click "Submit". Then, type your name under "Student's Name" and click the "Buy Now" button on the right to pay the course fee. If you do not wish to pay electronically, please register below and send a check for $100 to the Office of Hispanic Ministry at 610 E. Walnut St., Evansville, IN 47713. You may also register by calling Carlos Mayser at 812-618-7519.